Official name: Known as Traditional Balsamic Vinegar of Modena, this product must have the word “Traditional” on the label, otherwise it is not authentic. It is produced by cooking the grape must, which is aged for at least 12 years in different types of wood barrels. Grape variety : Trebbiano Modenese. Production zone: Province of Modena or Reggio Emilia. Properties: a thick syrup with a sweet flavor, and contrary to popular thinking, it is low in acidity. Its color ranges from yellow/brown to brown/black. Usage: According to producers, the best parings are with Parmigiano Reggiano cheese, beef and strawberries. While Mr. Montanari was talking about food pairings, I was debating on asking him regarding the use of Balsamic Vinegar on salads, and thus I did not want to sound as the typical ignorant person (I was before a connoisseur!!). However, I took courage and threw the question out: “I beg your pardon if I ask you this but, what’s your opinion concerning the use of Balsamic Vinegar as a salad dressing?” He replied: “You wouldn’t waist your Traditional Balsamic Vinegar of Modena on salad, would you? (Consider that 100 ml of goodness starts at 40 euro!!). To my joy (and not only mine), he then added: “However, we do sell what we call “condimento” or condiment/seasoning (dressing a salad in Italian means condire l’insalata); the difference lies in the fact that the condiment is not aged and the production process may include the addition of other ingredients to add thickness such as, starch, fructose syrup, pectins, guar gum, etc. So, whatever concoction that you have probably purchased before is prepared with watery, acidic ingredients- and who knows what else – and is certainly not Traditional Balsamic Vinegar of Modena. Cut strawberries lengthwise into 4 to 5 pieces. 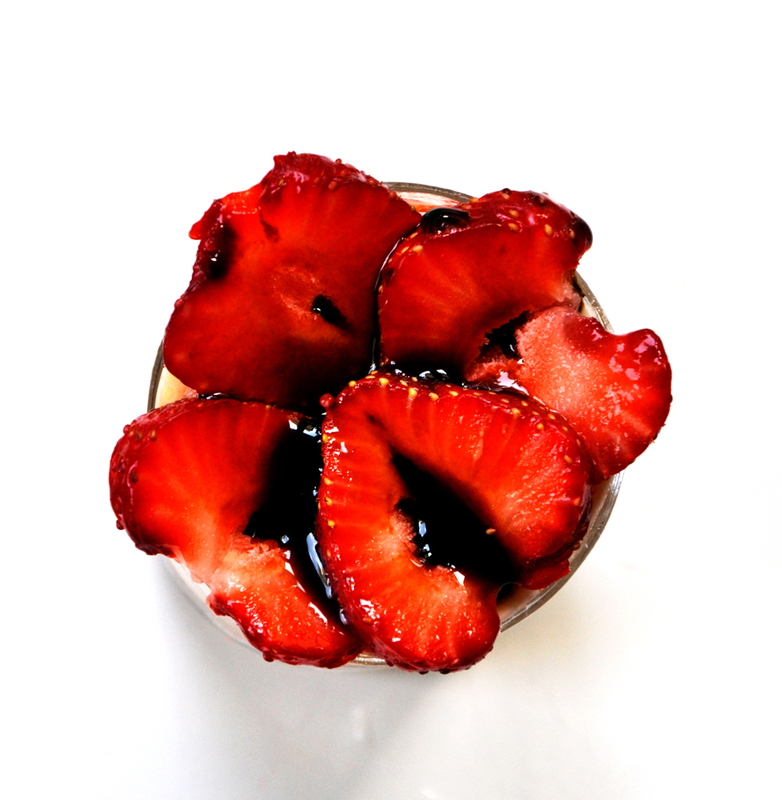 In a crystal glass or transparent glass (you can even use a wine or martini glass) place strawberries in the bottom and gently pour some Traditional Balsamic Vinegar of Modena on top. 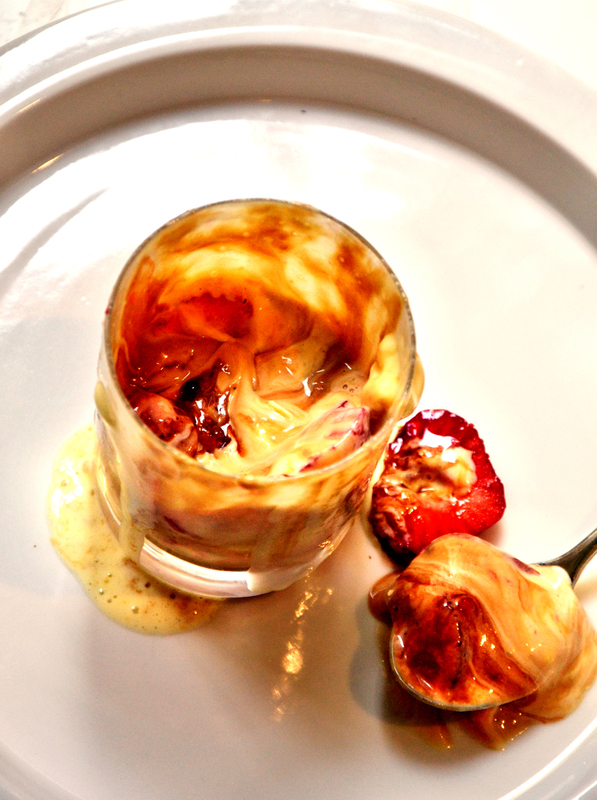 Add cream gelato and gently pour Traditional Balsamic Vinegar of Modena on top. Continue layering the glass until full. 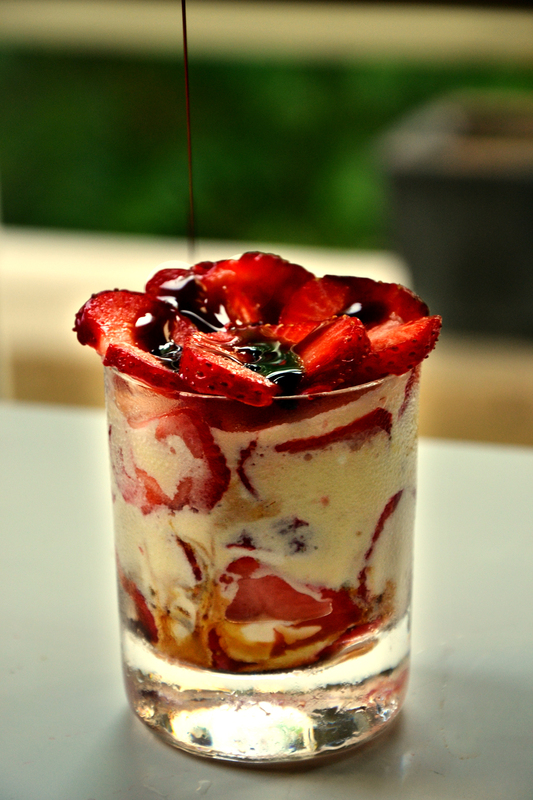 Note: Because of the high concentration of grape must in Traditional Balsamic Vinegar of Modena, be careful when pouring it over strawberries and gelato; that said, it should not overpower the final taste of this dessert – it should upgrade it!! This looks absolutely delicious. Would love to give it a try. Thank you Celi!!! You are so kind. I guess it might be hard to find. However, I have discovered a new world ordering products online!! Maybe you can find it in an online store!! Hi Lili! Thanx! It could. 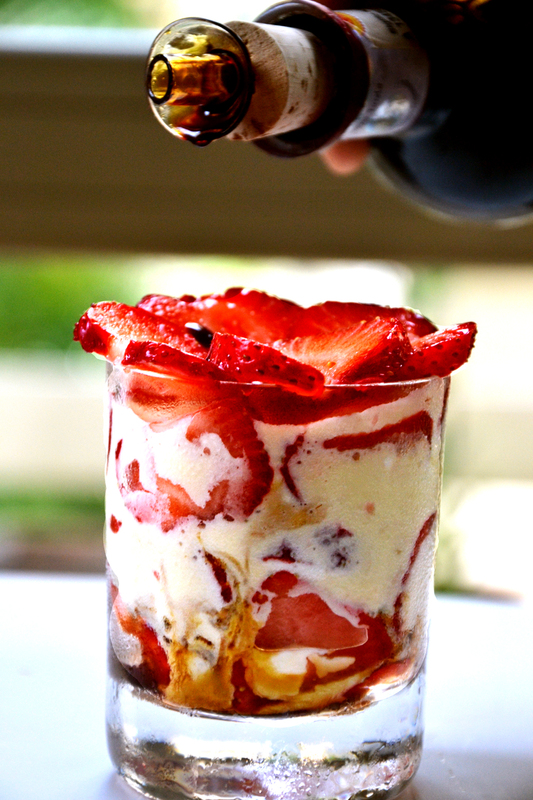 Just make sure you get very sweet strawberries and plain frozen yogurt (especially the one with less acidity)…the more plain it is, the better!!! Gisi, me encanta la combinacion. Ya lo voy a hacer! Una pregunta: el sabor del gelato? Es de vainilla? Hola Ani! El sabor del gelato tiene que ser crema porque es el mas neutral. El de vainilla podria no ser el mas adecuado debido a que el sabor de la vainilla cubriria los sabores que queremos que se destaquen: el de las fresas y el del Vinagre Balsamico Tradicional de Modena. That looks so good! I buy local balsamic vinegar, which is nice in salads and tastes good, but clearly isn’t the real thing like this is. Wonderful post and truly fabulous pictures. Wish I’d done them. Thank you Roger!! I’d wish you were here with us having that dessert!! What a great, informative post, Ambrosiana. Your photography was stunning. Well done! Thank you John! It was indeed very informative for us. Consider that before this trip, I thought that the right name was Balsamic Vinegar of Modena. I never thought that the word “traditional” was a must. Souds beautiful and I have been lucky enough to try the real thing…a very special long ago treat! Love that last shot….beautiful! Lovely dessert and photos. I have a bottle of traditional balsamic from our trip to Reggio Emilio year before last that I treat like gold…it is thick and delicious.